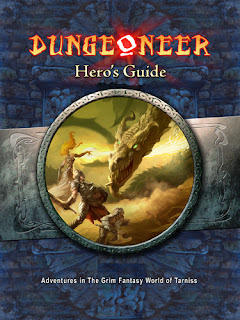 The final document for Dungeoneer Deluxe, simply called "Hero's Guide" is now in layout. There are still some loose ends to tie up in the back end of the book, various things like using other Dungeoneer sets with it and some optional rules. But I can really start to see the light at the end of the tunnel. This is a huge milestone in the long saga of developing this game. One of the fascinating things about product development is refining the components that will come in that product. There are a lot of factors, not only the game design which is the primary motivation. But also the cost of materials, the opportunities for higher quality components if you just adjust the design a little, and any number of other little things. Since Dungeoneer Deluxe has been in development for so long, I've reached the point where I really want to publish it and get it out to you! I don't like the word compromise, I prefer to think of it as practicality, but I have been focusing on taking this design that has been worked on for so long and making sure it can be published. What this means is that instead of being "vaporware" it will someday, soon, be a real product. 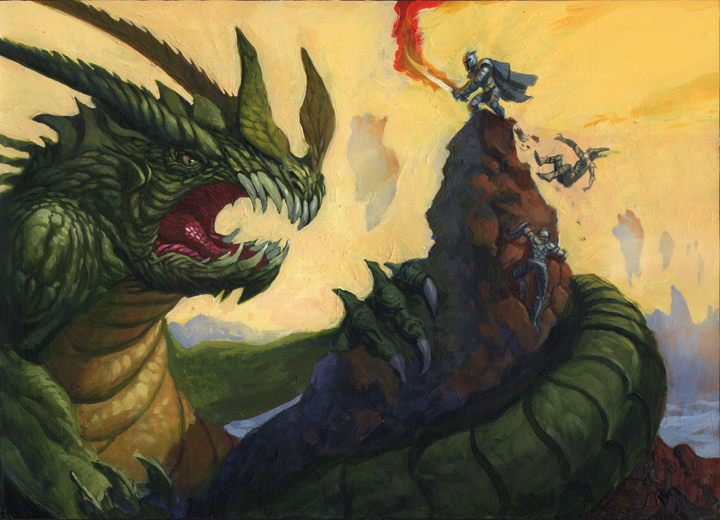 The greatest hero in the mythos of Tarniss - the grim fantasy world of Dungeoneer - is Gvandir. He is a mighty paladin who defeated the forces of Lashtar, demon lord of the abyss, in an epic battle. He sealed their defeat with the eternal whirlstorm over the island of Bandimar that prevents the demon hordes of the abyss from returning to Tarniss. 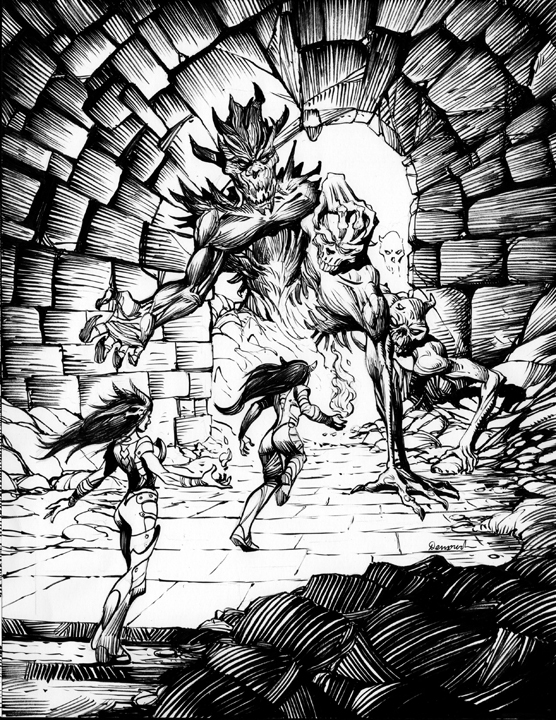 This is a drawing I did of Gvandir battling the demon hordes, it is intended to be an interior illustration for Dungeoneer Deluxe. Some time ago I did a drawing of a concept for Torchiere. 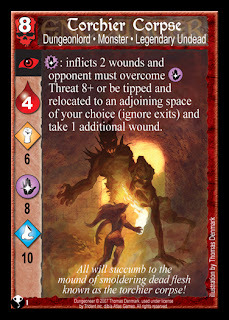 A card that had the effect of dealing damage over a series of turns agains undead. 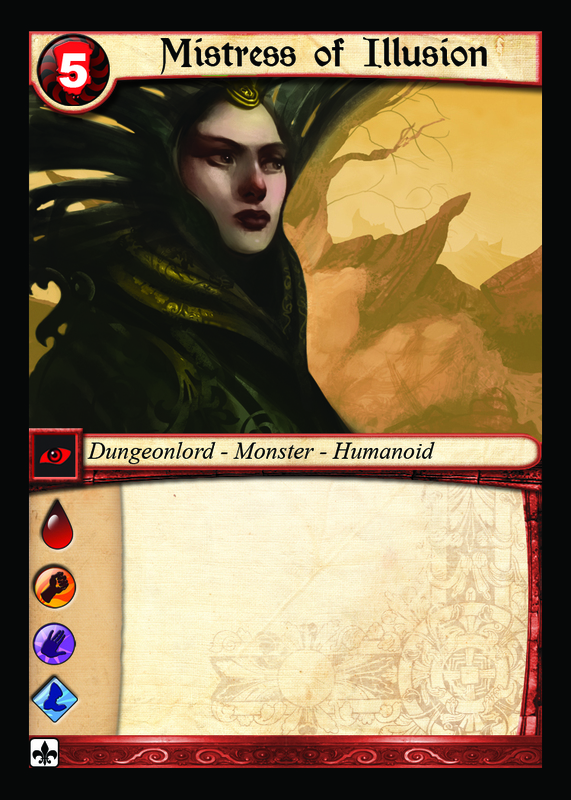 While the card mechanics itself has changed over the course of many playtests, the illustration I did for it has remained essentially the same. This is a drawing I did and recently inked for an interior illustration in Dungeoneer Deluxe. This drawing was inspired by a card from Wrath of the Serpent Goddess: Torchiere Corpse. 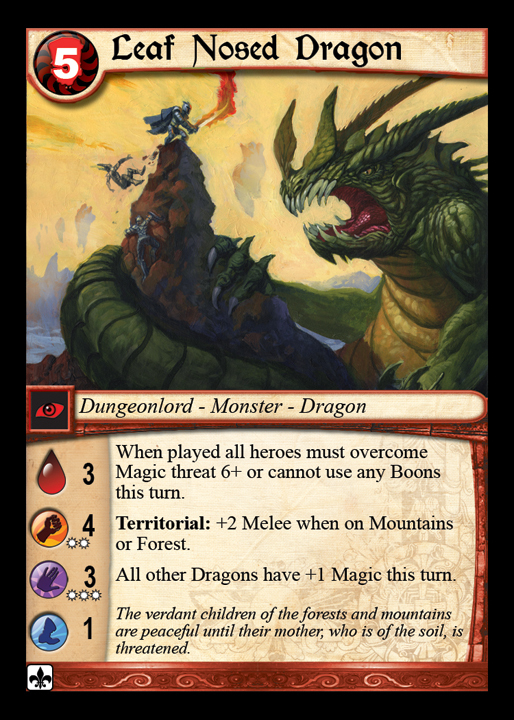 From the beginning Dungeoneer has endured accusations of less than perfect rules, though we have tried to rewrite and polish the rules a half-dozen times it was never enough to satisfy the critics (though sales remained strong). However, two fan-made gameplay aids have stood out as the best resources to help you play Dungeoneer. I have linked to these files for a long time, but I realize they are so valuable that they are worth bumping into the prime position on this blog. I have linked them on the top two links to the right in order to give them maximum exposure, especially for anyone new to Dungeoneer. If you buy a Dungeoneer set, toss the included rule sheet and use these resources instead. You will save yourself a lot of time and headache, and you will really enjoy the game. 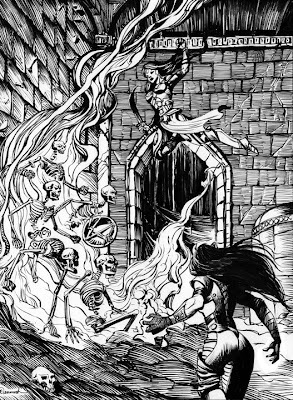 To me, the interior art of the Dungeoneer Deluxe booklets is every bit as important as the art on the cards. The interiors must be black & white due to printing restrictions, but I believe b&w art can be every bit as compelling as color art. Even more so in some circumstances. 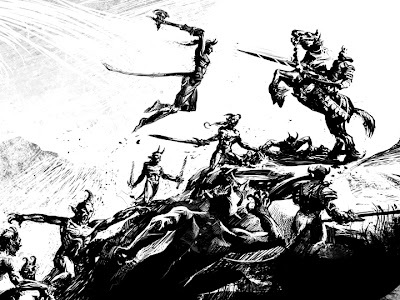 The limitations of b&w art and the stark feeling it creates can often lead to more compelling illustration in some circumstances. 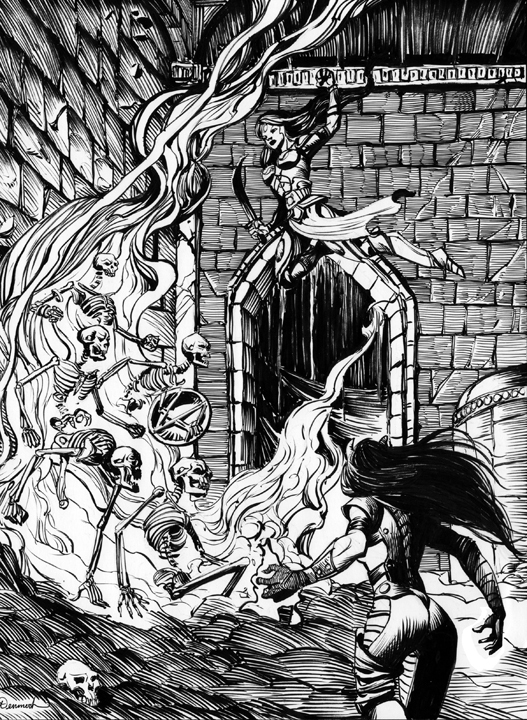 I have done quite a bit of pen & ink work for the interior illustrations of Dungeoneer Deluxe. One of my biggest influences goes way back to the early days of D&D: Dave Trampier. His inking style, and storytelling skills are an inspiration to me. 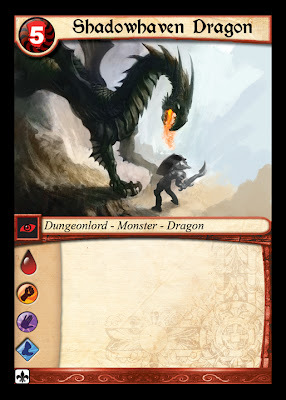 I have done a number of illustrations for Dungeoneer Deluxe using a brush trying to get that wonderful thick-to-thin quality Trampier achieved in his beautiful illustrations. This scene depicts a warrior chick leaping in midair and a wizard chick disposing of some pesky skeletons in a deadly dungeon. I wonder what the stats are on this little beastie? In 2003 a little game called Dungeoneer was published. I poured my heart and soul into the game, and it was incredibly difficult to make. 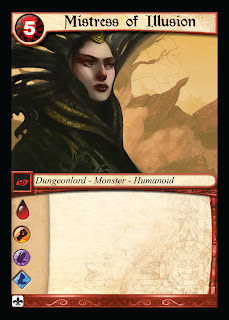 I had this idea: a genuine dungeon crawl in a deck of cards. The game was well received, probably what the movie industry would call a "cult hit". It made enough money that I was compelled to create additional sets, but never enough that I could quit my full time job. I was just rereading this review by Shannon Applecline, who has been a supportive Dungeoneer reviewer from the beginning. It brought back old memories and is inspiring me to make the Dungeoneer RPG (which will probably be released as "Dungeoneer Deluxe") the best I can make it. Getting printer's quotes. It's getting serious now. 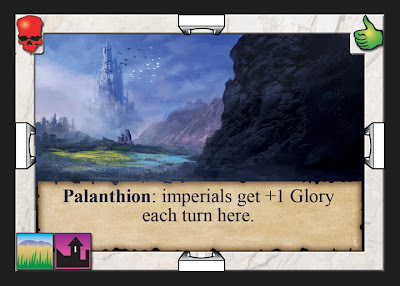 Palanthion is the capitol of Dolmaranthuz - the most powerful empire in Tarniss. It boasts the tallest castle-palace in the world, home to emperor Kaelus the great. If you are a citizen of Dolmaranthuz, an "imperial", you are afforded special privileges that no foreigners get - access to the socialized system of the empire. You may notice some subtle changes to the map card layout. 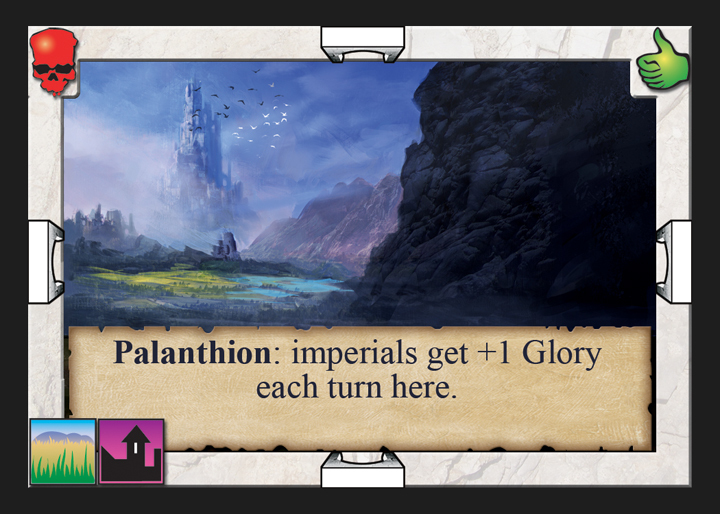 I think it adds to the legibility of the map cards, and makes the game better. (the final Peril/Glory value of the card hasn't been settled yet, so I've left that off. Playtesting, playtesting...this game needs to be awesome). Another card preview for the Dungeoneer RPG. This is a Leaf Nosed Dragon. They can be found in the heights of the Shadowhaven mountains, though they occasionally reside in deep forests, particularly when brooding. Yep, I flipped it for the card. Many of my illustrations are done digitally, but for the Dungeoneer RPG I'm trying to do as many in real paint (acrylics) as I have time for. This one is 10"x14" acrylic on Arches hot press watercolor block. A Dungeoneer RPG character sheet. 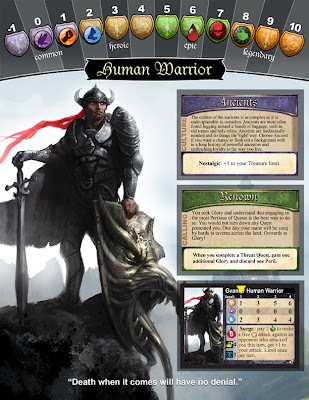 Human Warrior at 1st level with 1 melee, 0 magic, 2 speed, 6 life, 7 peril, 8 glory. His culture is "Ancient" and his calling is "Renown". I'll be at Wizard World Anaheim if you want to stop by and get cards signed, or get some art, or just say hi.